The NBB-20VS32-3 includes a robust selection of monitoring features, including event alarms and SNMP polling to help you keep tabs on vital network elements, avoid costly service calls and maximize up time. The NBB-20VS32-3 features a 32 Amp power input, (20) twenty remote switched IEC C13 outlets and (4) four 16 Amp UL-489 circuit breakers. Each circuit breaker protects 5 IEC C13 outlets and supports up to 16 Amps. 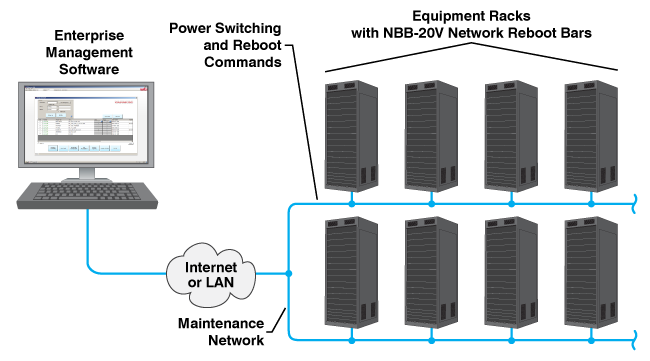 The NBB-20VS32-3 is built for vertical Zero U (0U) installations where rack space is limited. Mounting kits are available to fit a variety of rack and closet enclosures. The NBB-20VS32-3 can also perform remote reboots and power shutdowns on individual outlets according to a user-defined schedule, when a ping command fails or on demand. The NBB-20VS32-3 can be configured and operated via its convenient IP web browser interface or by any SNMP MIB based enterprise management software. To see a complete list of approved management software, or to recommend additional software or compatibility testing, please see our Software Integration section. DUO is a cloud based two factor authentication (2FA) service that corroborates the identity of each logon to ensure that users are actually who they claim to be. When a user enters an account name and password to logon to the NBB, DUO then re-authenticates the user’s identity via mobile phone or other device. This effectively shifts access protection from a perimeter based approach that relies on the privacy of the user’s logon credentials, to an application based security solution that requires additional interaction from the user before access is granted. In order to help simplify configuration and setup of SSL communication, NBB Series Products now support Subject Alternative Names (SAN). SAN is an extension to SSL X.509, that allows a selection of additional host names (DNS names, IP Addresses, Email Address and URIs,) to be protected by a single SSL Certificate. Subject Alternative Names allow you to perform virtual hosting of multiple SSL sites on a single IP address and eliminate the hassles involved in configuring multiple IP addresses on your server. Zero-Touch Provisioning (ZTP) simplifies day 0 onboarding of NBB units and in many cases, eliminates the need to have an engineer present during initial set up. If configuration information is not detected during boot up, Zero-Touch Provisioning will be activated and the device will contact a DHCP server and then download a configuration script and perform a firmware update without user intervention. This drastically reduces service interruptions due to human error and cuts the time required to set up newly installed NBB Series products.